This weather can certainly turn you blue if you’re outside too long. That's clearly not a good thing. But neither is feeling blue, which is what this particular day, Blue Monday is all about. Yes, we Canadians are tough. But even we get to whine on a day like this. Add to that the stress of school, a long commute to class and you've got the makings of a Blue Monday. “Very stressed and very blue,” adds Christina Thongvankham, who is studying to become a personal support worker. So what better place to go to find “the blues” than among students in the throes of studying, making it a great day to launch the Dog Squad, aimed at helping students deal with a little stress. It's no coincidence these canines are here on Blue Monday. Now, true be told, Blue Monday doesn't have much science behind it. It's more of a marketing ploy by a travel agency years ago to get people thinking about fun in the sun. That's not to say people aren't "blue" this time of year. Orr you can the approach that Bruce and Mary O’Neill are taking; hoping on a plane to Fort Lauderdale. If that price tag is too steep, doctors suggest some artificial light to boost your mood. Light therapy lamps are popping up even in some libraries now. And, keep up with the exercise. It's good for the body and the soul. 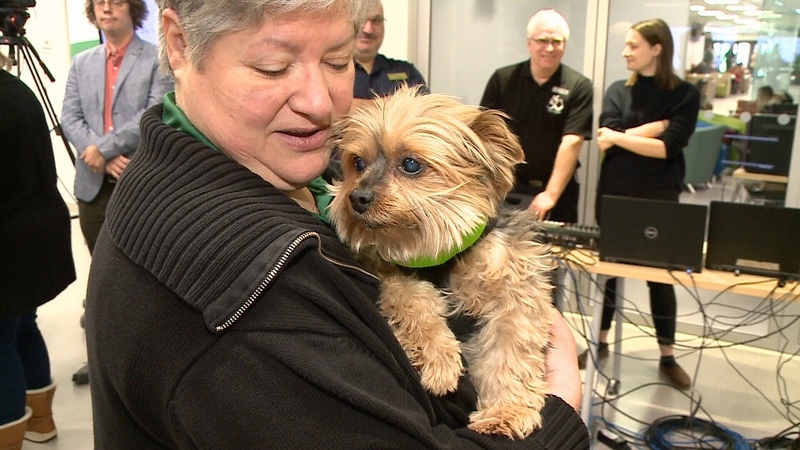 Algonquin students find stress relief with dogs.